NITRO-TECH POWER starts with a powerful blend of premium 100% whey protein for superior absorption, digestibility, easy mixing and high levels of essential branched chain amino acids (BCAAs) – the building blocks of muscle. MuscleTech researchers didn’t stop there, though. 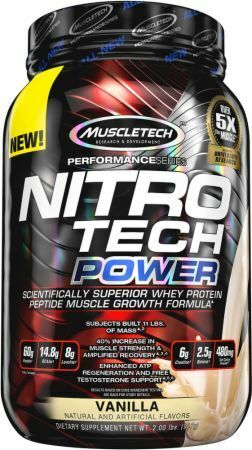 Each two-scoop serving of this incredible new protein is boosted with clinical doses of creatine monohydrate, betaine anhydrous, boron citrate and tart cherry – creating the ultimate muscle-amplifying protein!